Habitat loss, fragmentation and degradation are widespread drivers of biodiversity decline. 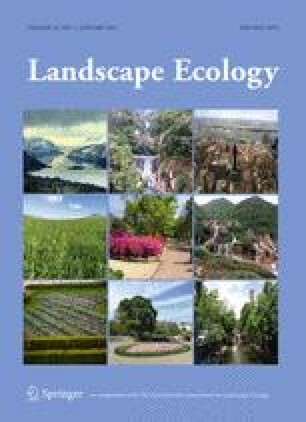 Understanding how habitat quality interacts with landscape context, and how they jointly affect species in human-modified landscapes, is of great importance for informing conservation and management. We used a whole-ecosystem manipulation experiment in the Brazilian Amazon to investigate the relative roles of local and landscape attributes in affecting bat assemblages at an interior-edge-matrix disturbance gradient. We surveyed bats in 39 sites, comprising continuous forest (CF), fragments, forest edges and intervening secondary regrowth. For each site, we assessed vegetation structure (local-scale variable) and, for five focal scales, quantified habitat amount and four landscape configuration metrics. Smaller fragments, edges and regrowth sites had fewer species and higher levels of dominance than CF. Regardless of the landscape scale analysed, species richness and evenness were mostly related to the amount of forest cover. Vegetation structure and configurational metrics were important predictors of abundance, whereby the magnitude and direction of response to configurational metrics were scale-dependent. Responses were ensemble-specific with local-scale vegetation structure being more important for frugivorous than for gleaning animalivorous bats. Our study indicates that scale-sensitive measures of landscape structure are needed for a more comprehensive understanding of the effects of fragmentation on tropical biota. Although forest fragments and regrowth habitats can be of conservation significance for tropical bats our results further emphasize that primary forest is of irreplaceable value, underlining that their conservation can only be achieved by the preservation of large expanses of pristine habitat. The online version of this article (doi: 10.1007/s10980-016-0425-3) contains supplementary material, which is available to authorized users. We would like to thank the many volunteers and field assistants that helped during fieldwork, Tobias Jeppsson for providing a modified version of the hier.part function for the hierarchical partitioning analysis, and the BDFFP management team for logistic support. Funding was provided by a Portuguese Foundation for Science and Technology (FCT) project grant (PTDC/BIA-BIC/111184/2009) to C.F.J.M. R.R. was supported by FCT (SFRH/BD/80488/2011), A.L.-B. by (FCT PD/BD/52597/2014) and CNPq (160049/2013-0), P.E.D.B. by CAPES and M.C. by Academy of Finland (grant #257686). Research was conducted under ICMBio permit (26877-2) and is publication 698 in the BDFFP technical series.